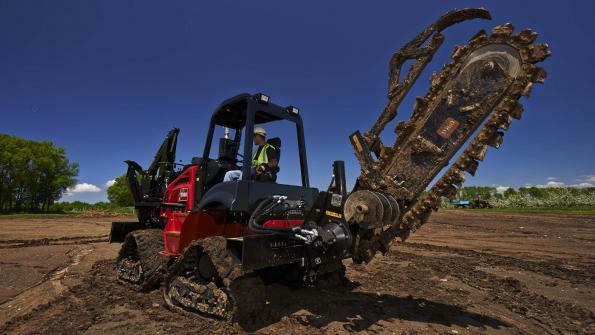 New option packages for Toro's riding trencher lineup can help boost the productivity of underground utility crews and contractors. Choose from several attachment options on the Toro trencher product line, including a direct drive trencher (available on the RT600). Also available: a combo-mount system (available on both the RT600 and RT1200), and a sliding offset feature (available on both the RT600 and RT1200). The options can help boost the productivity of underground utility crews and contractors, according to the company. Toro also offers two options of trencher drive styles. The HD PowerTrench drive stores power from a flywheel that is transferred to the torque-amplifying planetary system. The drive gives the HD trencher the power to overcome rocks or other obstacles in a range of conditions. In contrast, the hydrostatic direct trencher drive delivers durable, cost-effective trenching performance in less demanding conditions, according to the company. With the new hydrostatic direct drive trencher, the operator is able to perform trenching functions by using hydrostatic and inertial energy for solid performance. The direct drive trencher can also be used as one of the attachments on the new combo mount system in conjunction with the Toro P85 plow attachment. The product’s combo mount system can potentially minimize downtime by allowing both a trencher and a plow to be mounted to the back of the machine. This eliminates the need to change attachments depending on installation requirements. The RT1200 combo uses the HD trencher drive and the P105 plow with blade attitude adjustment. The RT600 combo uses the new direct drive trencher in combination with the heavy-duty P85 plow attachment. The use of the combo mount gives the operator increased versatility by adding an attachment without sacrificing performance. Also available on the company’s line of riding trenchers is the sliding offset feature. It increases accessibility in tight locations by allowing the attachments to slide one way or the other. This maximizes productivity on the jobsite by facilitating the placement of utility lines closer to the desired location without the operator having to reposition the entire unit, according to the company. The new attachments will be available on the RT600 and RT1200 riding trenchers in the spring of 2016. The Toro Company is a worldwide provider of turf, snow and ground engaging equipment, as well as irrigation and outdoor lighting solutions. See how the Toro HD trencher drive system works in the video.